It was a dark restobar with a wobbly iron staircase, terracotta floor tiles and stacked Coca Cola crates. Two old men were having a one-sided fight outside. The first lurched onto the street and hit the other on the shoulder in the way that you might greet a friend. The second took it badly, started shouting and pummelling the drunk man’s shoulders. He kicked him in the arse and he fell over and lay as helpless as a beetle on its back. A policeman saw them, strode over, helped the drunk man up and sent both of them on their way. Aguas Calientes began, a century ago, as a camp for railway workers and still looks as if it might be abandoned on half a day’s notice. The buildings seem to have been put up in a hurry and occupied before they were finished. The only road out leads up to the mountains. 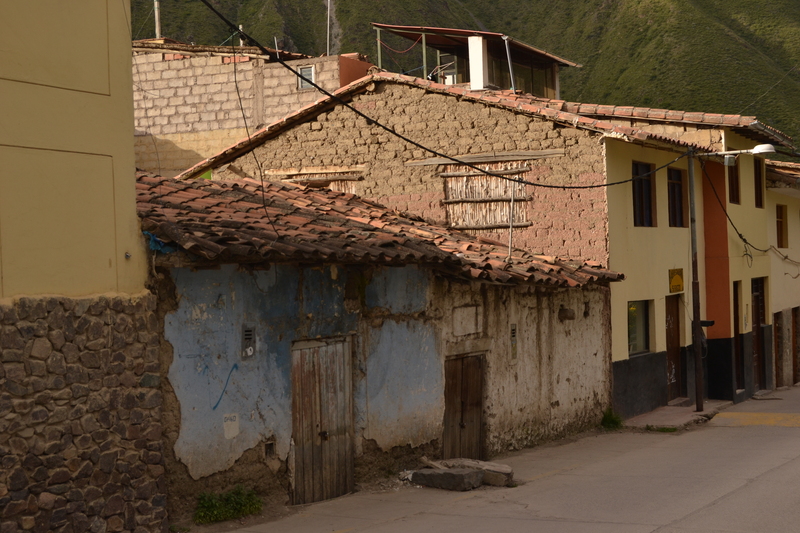 The railroad alone links the town to the rest of Peru. The tracks serve as the high street and shops and restaurants open straight onto the platform. When the train approaches, a man in a cap strolls out of a bar and onto the track and waves a red flag and pedestrians shuffle aside. The train passes and whistles and the man with the flag goes back to his drink and the pedestrians pick up their journey. 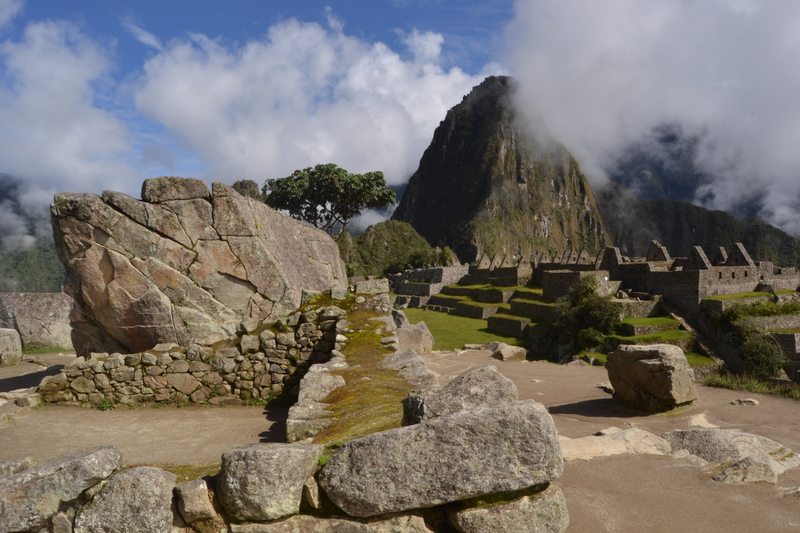 I had reached Aguas Calientes the hard way, via the Inca Trail, and seen a glimpse of Machu Picchu at the end. I got back on the bus to the mountains in the morning to see it properly. There had been a landslide a few days earlier and there were rocks the size of houses at the side of the road. A team was working to clear them but progress was slow; sledgehammers made little impression on rocks of that size. There were more rocks overhanging the road and it seemed as if a sneeze might dislodge them and if one had fallen with the bus underneath there would have been nowhere for the driver to swerve. There was a boulder in the middle of the road near the top, blocking it to traffic. The bus stopped and disgorged the passengers and we walked round the corner, up the hill, to another bus which took us the last few hundred yards. Around lunchtime, then, I took the two buses back to Aguas Calientes and bustled onto a train to Ollantaytambo, just as it was about to leave, and gazed out the window at the angry river, an Amazon tributary, and the verdant mountains either side, and adobe villages with political slogans painted on walls, and Quechua ladies leading llamas, and tethered donkeys and free-ranging pigs, and a dog trying to face down a bull which was roped to the ground from a ring in its nose. 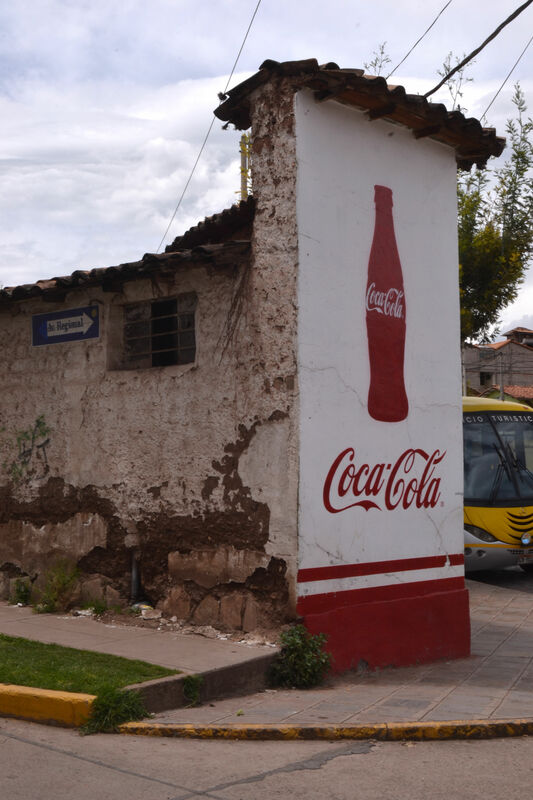 I forced my way through and got on a bus to Cuzco. I had stayed there before but had only seen the Centro Historico and the scenic route out past the Incan ruins of Saqsaywaman. The western suburbs are nothing like that, with rubble and weeds where the pavements should be and houses of unpainted concrete and rusty rebar sticking out of roofs and people buying provisions through bars on the doors of the shops. As so often, the bits which the tourists see have little to do with the lives of ordinary people who live there. ← Rīga, You’re Lovely, but Please Let Me Sleep!